Synopsis: From the director of The Bourne Ultimatum and United 93, comes a factual account of the Maersk Alabama hijacking in 2009. A group of Somali pirates board the Maersk Alabama and take Captain Richard Phillips hostage and demand a ransom while the US Navy pursues the pirates to rescue Captain Phillips. Review: A nerve-wracking, suspenseful and riveting thrill ride. 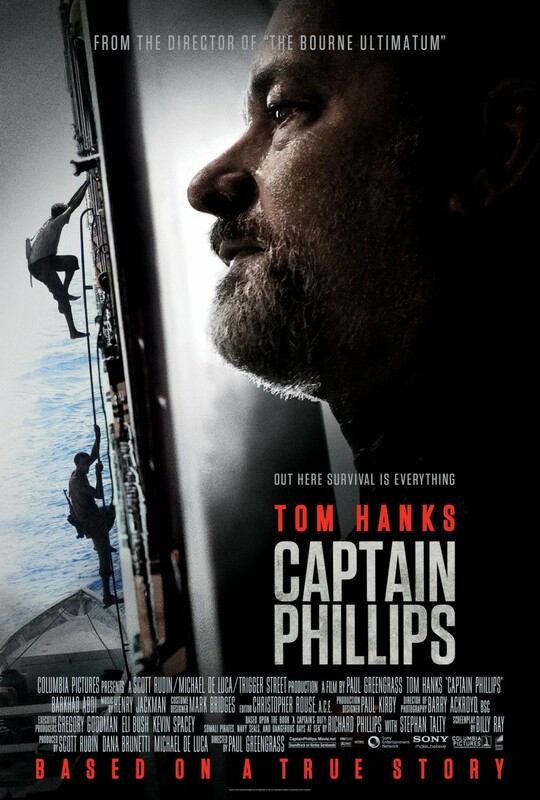 Right from the beginning of the film, the suspense immediately begins to build as Captain Phillips and his crew set out on their journey on their ship full of goods. As Phillips and his team set off, the perspective switches as we see the Somali pirates and what drives their malicious and cruel intentions. The fact that they must go out to these cargo ships and return to their superiors with hostages and or money, otherwise they will face dire consequences. This desperation is displayed emphatically by the leader of the Somali pirates Abduwali Muse, who is portrayed brilliantly by newcomer Barkhad Abdi in what is a fantastic debut big screen appearance. You see the dark desires that haunt him and the motives that force him to do what he has to do. You can see in his eyes his rage drives on the other pirates to carry out their evil intentions and that there is a point where there is no going back. It is either deliver the goods, or in this case hostage, or die. From the minute the pirates begin their pursuit of the Maersk Alabama, your heart is immediately racing and you are kept on edge right throughout the pursuit as you watch it unfold on the screen. When the pirates board the ship, your heart still continues to pound as there is a constant fear that the pirates will at any given moment shoot one of the ship’s crew dead. For every action that is taken by both sides, there are consequences and these consequences can be fatal. You are kept on the edge of your seat throughout the raid. The suspense escalates even further when the pirates take Phillips hostage and threaten dire retribution against him unless they receive monetary gain. However, the final climax of the film sees the intense drama on screen go up another gear as the standoff between the pirates and the US Navy reaches an unbearable level. I could feel my heart pounding inside my chest as the climax was unfolding. Even after the film had reached its conclusion, my heart was racing. Along with a great breakout performance from Abdi, Tom Hanks is on magnificent form here as the titular character. He is calm and collected when he appears to be facing certain death at the hands of the pirates. Yet at the same time, when he is put in this awful situation, he comes out fighting and shows the desire of a man determined to win his freedom and see his family again. While they are two very different characters, the two main men are both play out their roles exceptionally well. Yet the best is saved to last with one scene right towards the end of the film that leaves you completely taken aback by Hanks’ magnificent acting. This is a film that should at the very least land Hanks an Oscar nomination next year for his breath-taking performance and also maybe even land Greengrass a nomination for his outstanding directing. This film is one of the most intense films that you will ever watch in your life. The two main men are brilliant in their roles. The action was incredibly intense and the score of the film was equally impressive. Great films sink their claws into you and ensure you are thinking about the film long after you have left the cinema. A thrilling adrenaline ride and this film is definitely has definitely sailed into one of the best films of the year so far. Packed with terrific suspense, brilliant acting from Hanks and Abdi with masterful direction from Greengrass, a thriller that thrills in every sense of the word.